Following the lead of Red Robin, Burger King is testing an Impossible™ Whopper® sandwich in St. Louis, MO. 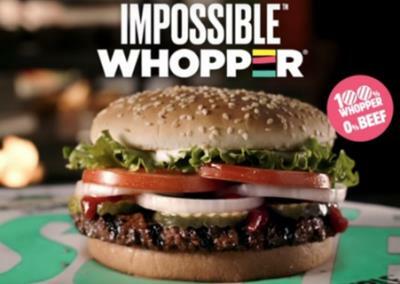 The Impossible™ Whopper® has no beef incorporating a vegetable-based patty with tomato, lettuce, mayonnaise, pickle and a slice of onion on a toasted sesame seed bun. It appears that QSRs will test the Impossible™ brand and alternative clones, but the jury is out whether consumers will accept alternatives to beef. It is possible that menus may be expanded to provide an option for those unwilling to consume beef for health and presumed concerns over sustainability and the environment. It is however evident that from a technical perspective, vegetable-formulations can substitute for beef in QSR sandwiches. Replacing chicken will however be a much more difficult task. If in fact there is any resistance to vegetable-based burgers, consumers may continue their trend towards chicken sandwiches to the benefit of the broiler industry.